This was our “Rally Day” or recognition of the start of School week. (We delay a week typically due to the labor day weekend.) So, there are parts of the service – like the installation of Sunday School teachers, and blessing of backpacks – that I couldn’t get on the recording. Physically we did them down in front where our various mic’s don’t capture too well. That blessing was probably the key to thinking about this sermon unfortunately. In my head the sermon is an existential one. It points out a common thought, looking up at the night sky and what do you see? There are naive answers, but nobody really holds those long. That is the purpose of the Lion King reference. The existential question of that sky (a sign) is: is their order or is it all just chaos? The answer revealed to us by the Word of God is that there is an order. In our sinful condition we are like the deaf and mute man in our text, unable to hear the music of the spheres. But Jesus has come to give us back the ability to hear. 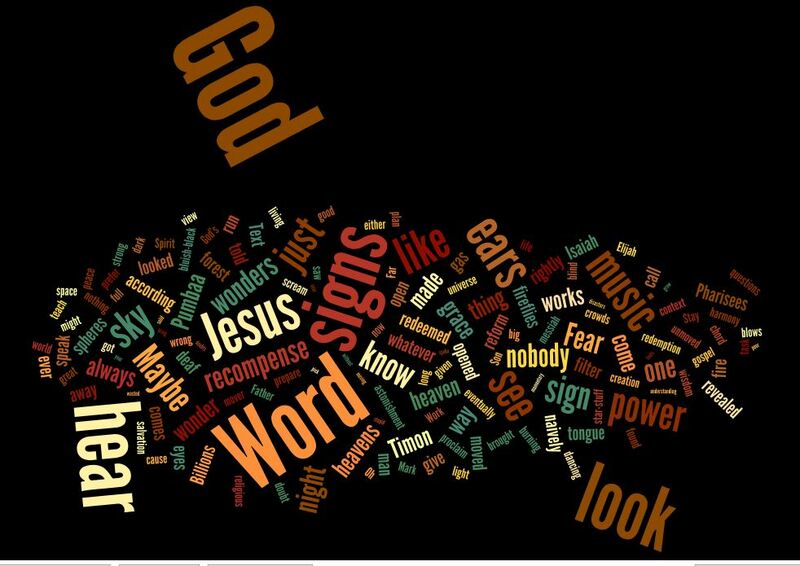 That same Word that tells us of God’s loving order, opens ears and loosens tongues. And in the application to educating, learning/education/wisdom which is based on that word is a worth endeavor, because God desires to be known just as we are known by Him. The universe makes sense, the foundation of which is revealed to us in the Word of God, so we can grow in Wisdom just like Jesus. It is not the dark forest nor the great filter that haunt our minds when we tune out the music of the spheres. Mary and Martha. That used to be the jumping off point for a bunch of buddy stories. But the text is not about a conflict of personality. The revisionist and womanist (or is it womynist) preacher makes great hay out of this text. Martha is the enforcer of accepted patriarchal social scripts which Mary chooses to ignore. Jesus backs up her choice securing her already grasped freedom. (Just to be clear, Mary moves first, Jesus just gives moral support). But that would seem to be majoring in minors – although there is enough truth you can’t just scoff. The context is the help. Last week was the good Samaritan and in previous weeks the 70 were sent out and great things are happening. The whole contingent is on the move. They are doing great things. The disciples, and us the reader, could be forgiven for taking the point of the Christian life as being a heroic do-gooder. And then we see the ultimate do gooder. Martha is serving everyone…and Mary just sits. Jesus, do you mean what you’ve been saying? Like Martha, the church is full of care and distracted by all the things that need taken care of. And there will be plenty of opportunity to serve. Nobody ever gets in your way when you don the role of the servant. But the world, the devil and our own flesh will labor mightily to keep us from the Word. Service not grounded first and firmly in the Word of God is just so much trouble. The one needful thing – the one thing that we can’t go without is the Word. And that is typically presented as a choice. Do we choose the feet of the Jesus, or our cares? Everything else shall pass away, but what is done at the foot of the cross will never be taken away. If you are of the ’80s generation you have that song in your head, just go ahead and admit it. Now why I used it: this short piece by Heather Wilson who sits on the Rhodes Scholar committee (i.e. selecting them) and has been a US representative. Read Here. As a result, high-achieving students seem less able to grapple with issues that require them to think across disciplines or reflect on difficult questions about what matters and why. Unlike many graduate fellowships, the Rhodes seeks leaders who will “fight the world’s fight.” They must be more than mere bookworms. We are looking for students who wonder, students who are reading widely, students of passion who are driven to make a difference in the lives of those around them and in the broader world through enlightened and effective leadership. The undergraduate education they are receiving seems less and less suited to that purpose. Not that she would listen to me, after all I’m just a humble parish pastor, but I can tell you exactly why she doesn’t get the kids she’s thinks she’s longing for (all the good men…). Our education system is not designed to uncover truth except in the narrowest possible way. It doesn’t even aim at truth, and good portions don’t believe in that word. Absent of truth, the only thing to be passionate about is consumption and power. The students that succeed wildly in our system are those that learn early that the actual questions don’t matter, just that you are on the right side of whatever the question is for the immediate context. And those students get very good at giving the right contextual answers, posing an ironic stance outside of the classroom (again the right context), and never earning either. Reading widely, wondering and having passion are all signals that you don’t actually get it. They are the very activities that our education and merit system weeds out. The student who stumbles, shows some real passion for the wrong side because she read Plato’s cave and saw a flicker of a shadow of reality gets the A minus. The A minus takes her out of the running for valedictorian, etc, etc, etc. To find the student she is describing the Rhodes would have to change their sort and put their prestige at risk as the Rhodes would look different that everybody else. To find your life, you must lose it. Just a personal reflection. The confirmation class knows that I have “answers” to the questions I ask. My goal is actually less to get them to that answer then to get them thinking. If I get them thinking they may never be Rhodes Scholars, but they might be those good men and women. But these 6-8th graders have already fully learned the lesson of right answers in the right context; they are just a little more flip in my class because I can’t grade them. One student in particular has taken to “locking in” his answers. Trying to break that ‘learning is a game’ cynical reaction is necessary.